There was no way I was expecting any sort of great revelation at the Jockey Outlet Store in Lake Arrowhead…certainly nothing beyond learning that I could save $10 on my next $50 purchase if I signed up for their customer loyalty card (a.k.a. data tracking program). All I wanted was some new t-shirts — Jerry Garcia-style with the pocket — and then to be on my way. It started with the kind clerk who mentioned as he was bagging up my purchase, “Oh, just so you know, don’t use dryer sheets when washing these. We’ve learned they ruin the ‘stay dry fabric’ process we use.” I thanked the clerk for the information and then “Onyx” and I left to do our grocery shopping. As I kept thinking about what the clerk said, I became a little concerned about washing these new t-shirts. While I got these solely for the comfort and pocket (I had no idea about this special “stay dry fabric”), I wondered if using dryer sheets would make them wear out faster…after all, Jockey stuff ain’t cheap even at their outlet stores! Yes, maybe I could wash them separately, but then there’s another mostly unnecessary extra load of laundry to add to my gas, electric, and water bills, and all for just three plain t-shirts. That evening, my thoughts wandered back to what the clerk had said. As “Onyx” has allergies to a lot of perfumes and scents used in laundry products, I turned to the Internet to do a little research. My thinking was that maybe we could switch from using dryer sheets to putting in a liquid fabric softener during our wash. We really need this not so much for the for the softening but to kill off the big-time static cling that we get due to the extremely dry climate we live in. For just me, my concern is making sure my laundry gets truly clean and smells fresh no matter what combination of products and methods I use because I’m one of those guys who sweats like a pig at the drop of a hat. What I wanted was to find a good fabric softener that would be the least likely to make “Onyx” sick to try to not make our first purchase a waste of money. What I found once I hit the Internet shocked me. I like to think I’m fairly well informed about all the things in our supermarkets and drug stores that are bad for humans and/or the environment. It just goes to show that everybody always still has something to learn because I had no idea how terrible both liquid fabric softeners and dryer sheets are, even the unscented ones. The avalanche of information that came up when I searched “safe fabric softeners” stunned me. Once I started looking at various pages, I was also struck by the varied sources from which it all came. On personal sites, it wasn’t just the granola-and-sandals crowd warning people about this stuff. One of the most detailed pages I found was on the site of an otherwise very conservative Christian woman who, in this case, could not ignore the science showing how bad these things are. The ultimate kicker for me was when I found this subject discussed on the Scientific American website. When it comes to what is right and wrong about science, it’s hard to beat good ol’ SA. While it may be nice to have clothes that feel soft, smell fresh and are free of static cling, both types of products contain chemicals known to be toxic to people after sustained exposure. According to the health and wellness website Sixwise.com, some of the most harmful ingredients in dryer sheets and liquid fabric softener alike include benzyl acetate (linked to pancreatic cancer), benzyl alcohol (an upper respiratory tract irritant), ethanol (linked to central nervous system disorders), limonene (a known carcinogen) and chloroform (a neurotoxin and carcinogen), among others. Since fabric softeners are designed to stay in your clothes for extended periods of time, such chemicals can seep out gradually and be inhaled or absorbed directly through the skin. Liquid fabric softeners are slightly preferable to dryer sheets, as the chemicals in dryer sheets get released into the air when they are heated up in the dryer and can pose a respiratory health risk to those both inside and outside the home. This was a shock to both “Onyx” and me. Perhaps this explained why she would have various allergic reactions for no apparent reason. Even if not the source of her attacks, this and all the rest was all I needed to know. A change had to be made immediately. Looking for an alternative, I started with those listed near the end of that SA article. As I researched those products, the reviews were mixed to say the least. The reusable dryer sheet was the worst of them all, so I threw that out immediately. The regular, disposable dryer sheets had a lot of complaints that the scented ones were too strong (not to mention that they all use lavender and that’s not exactly how I want to smell) and that the unscented ones were ineffective against static cling. The reviews for the alternative fabric softeners were not much better. Unhappy with these alternatives that were expensive, not available in stores in our area, possibly ineffective, and over-scented to the point that, even though more “natural,” they would still be irritating, I remembered staying at a friend’s house where she used dryer balls. I didn’t recall the ones she used as being all that effective especially against static cling. So, I searched to see if something more fancy had come along that was better than the rubber ball with nubs all over it (which came off on occasion and, in my opinion, left a rubbery smell on one’s clothes). I also wanted something lighter as we have a stacked washer/dryer unit. I feared that the standard rubber dryer balls would take too much of a toll on our dryer and, if anybody knows the outrageous cost of a regular washer and dryer set, take a look someday at what one of these stacked units costs and my concern will be quickly understood. Not long after becoming dissatisfied with fancy new styles of dryer balls, I started to come across “homemade” alternatives. At first, I looked at a bunch of sites and video clips describing how to make liquid fabric softener and dryer sheets at home. The dryer sheets were far too time and space consuming for our small house. As for liquid, many of the recipes called for using cheap hair conditioner — something also filled with terrible things for humans not to mention animals and the environment as a whole. This led to finding the recipes that used vinegar and essential oil but that still leaves one’s clothes smelling just slightly like an Easter egg. I saw some that suggested using tennis balls as dryer balls. At first, I thought this was a great idea because one could certainly apply a few drops of essential oil on the fuzz to get an aroma. However, there were too many stories from others that tennis balls can wear out very suddenly and get to the point where the rubber melts…and, there was my concern again over their weight. Of course, there’s always hang drying. That might work in many places especially suburbs where everybody has a neat lawn. It doesn’t work in the Inland Empire where dust is always blowing on and off even outside of Santa Ana wind conditions and certainly not in its mountain communities where almost nobody has a true lawn and evergreen trees are constantly dropping sap-covered needles. Oh, and then there are those of us who have dogs that consider hanging laundry a challenge — flapping pieces of doggy torment in desperate need of being snatched and torn apart so they never threaten the back yard ever again. I was just about to end my search and go the vinegar and essential oil route when I spotted one more suggestion. It was so simple, easy, and relatively cheap that it couldn’t possibly work, could it? Holy crap! It works…and damn well! Yes, that’s right. Aluminum foil balls! 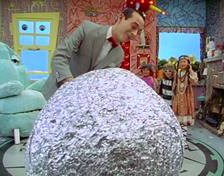 Now, you can’t let them get as big as Pee-Wee Herman’s but, with very minor maintenance and occasional replacement, three aluminum foil balls placed in the dryer will eliminate static cling even in the driest of climates, do not add any odor yet do not take away any scent used in one’s laundry detergent, and are heavy enough to soften the clothes while not being so heavy as to expose the dryer to extra wear and tear. The process for each ball is very simple. From a regular-sized roll of aluminum foil, tear off an approximately two-foot long piece (~60 centimeters). From an extra-long roll, tear off a piece between one and one-and a half feet long (~30 to ~45 centimeters). There is no need to be precise in these measurements. Wad this first piece of foil into a ball. It does not have to be absolutely round or smooth — the dryer will take care of that later! From either sized roll, tear off an approximately one foot (~30 cm) piece of foil. Wrap this around the original ball as smoothly as possible but, again, perfection is not necessary. Repeat step 3 until the ball is approximately 3-inches (~7.5 centimeters) in diameter. Make a total of three foil balls. Place in dryer and run as normal. 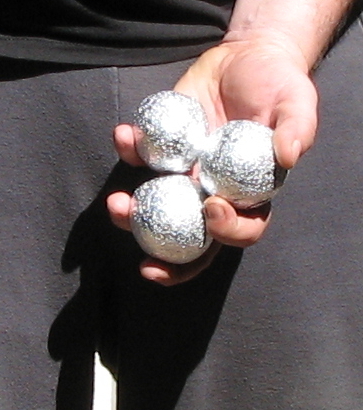 Every week, place one new piece of foil around each ball as described in Step 3. The timing of this might need to be adjusted depending on how much drying is done — some households might be able to go two weeks between this step and others with large families might need to do it twice a week. This step makes sure each ball retains its ability to absorb static and keeps its overall physical integrity. Once the balls reach approximately 4 inches in diameter (~7 centimeters), they will then be close to becoming too large to be safe in the dryer. Make three new ones and either recycle the old ones or start making your own giant foil ball. Yay! Let’s see how big my foil ball is today! Yes, I feel sort of weird now that I am apparently giving out household tips on this blog. Then again, this is important…and, if a supposedly informed person like me didn’t know about the dangers of fabric softener and dryer sheets much less the easy solution to eliminating them, I figure this is worth sharing. I am definitely looking forward to seeing how this works long-term not only in keeping “Onyx” from having more allergy attacks than she should but also in how this might help our clothes last longer…as I have certainly noticed certain items that wear out when and where they shouldn’t and most of those coming with a residue that can only be explained by the chemicals used in my wash.
What I am also excited about is that this discovery has opened up a whole new world of household product alternatives to me — far more than the ones I already knew where most anything can be cleaned with vinegar, baking soda, or lemon juice. Even if I find just a few that work, they end up resulting in great savings with the bonus of being better for our environment. Just think in this case how much less it costs to take a few minutes to make aluminum foil balls instead of buying a bottle of Downy. If a good detergent is used, believe me, laundry will still come out smelling fresh. Of course, there is one caveat to the foil ball solution. Mining and processing of aluminum isn’t exactly a clean industry. It just goes to show that not every solution is perfect. It also goes to show that The Man has his hands in everything and that he can never be completely avoided. In this case, I’ll take the course of hoping further measures will be implemented to make aluminum processing cleaner and enjoy its ability to be recycled rather than wear carcinogens on my clothing which come from products that either go down the drain and into our oceans or straight into our landfills. And, let’s not forget about detergent…”Onyx” and I have been using Arm & Hammer as it has seemed like the best choice that doesn’t set off her allergies, is best for the environment (hey, it’s the baking soda people, right? ), and — unlike many “natural” alternatives — actually gets clothes clean. Well, I’m looking into that now as well because even seemingly benign Arm & Hammer may not be as friendly as I once believed. Even if safe, there’s the savings to consider. With a gallon of good laundry detergent in the store often costing twice as much as a gallon of gasoline (maybe even more if one buys a popular brand such as Tide), the time spent making some at home could end up gaining enough money to fill that gas tank a few more times. Then there’s the side effect I’m always looking for here — sticking it to The Man by not supporting his criminal activities under his various branches such as Procter & Gamble and Unilever. I’m still researching the detergent angle so, maybe, it will be the next “household hint” that shows up here. Rest assured, one way or another, whatever else shows up on KoHoSo.us in the future will always be in one way or another about sticking it to The Man. After all, look how many people have no idea that products like Downy and Bounce leave people basically wearing cancer every day. If that’s not an evil that needs to be exposed, I don’t know what is. My balls became very smooth after just one run through the dryer! Posted in AdviceTagged dryer sheets, fabric softener, laundryBookmark the permalink.